I saw this cover and knew this was a project for me for a few reasons...1. our porch needed some attention in the pumpkin category...2. friends gifted us a bunch of squash...and 3. I love toadstools. So one morning while the girls were away at school or playgroup, my son and I donned aprons and set to work. We had such a good time and he loved the one-on-one time so much that half way through the project he told me spontaneously that he loved me. It was so sweet! What a good reminder to spend more time like this with my children individually. 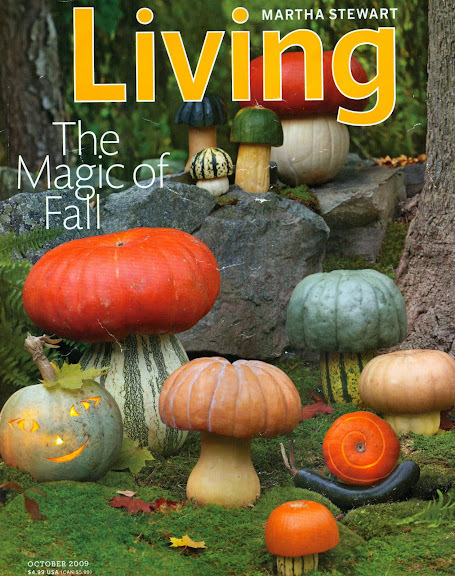 I loved this Living cover when I saw it too, and I tucked it away in my inspiration folder. 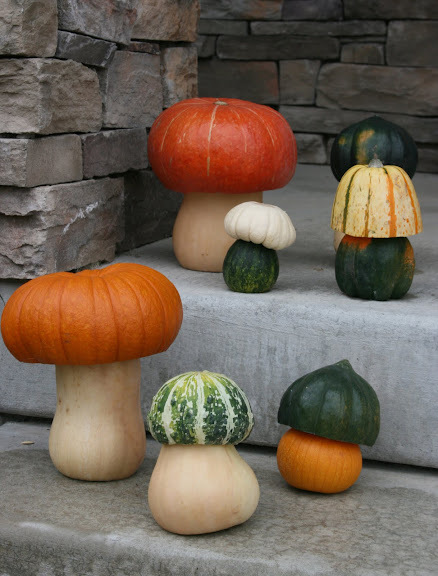 My gourds are already serving a different function this year, but next fall I plan to make some of these toadstools to put at the base of the large pine tree in my yard. What a fun little project for you and your son! Your toadstools turned out so cute. I saw your porch and it looks even better in person! They turned out so cute ... I'll have to try these. Those are gorgeous, great idea. Will definitely have to remember that next year. what an awesome idea, yours looks just like the cover of the magazine! They are so cute, I will have to remember that for next year! That looks great! I want to try this with my fairy loving daughter! Such a cute idea! Very whimsical and classy at the same time! I like yours better than the Martha cover. Thanks for sharing!! Not bad! You're just missing the rocks! I've never seen that idea. Clever! I too saw that cover and thought it was darling, yours is very cute also. I wanted to tell you how disappointed I was in that new restaurant COmmunal that you recommended. I was completely amazed that you recommended it. After 5 things, dessert and a bill of $80.00 the three of us were still hungry and we are small people. I don't know how they will ever make it, not to mention in Utah county. I hope no one else goes there because it is definately not worth the price or atmosphere. Just thought you should know. You guys are so sweet to say so many nice things...I am loving your ideas as well. Andrea, I wish I had a big tree in my yard so I could place these at the base like you recommended and I love the fairy party idea too. Rach, I am sorry you didn't enjoy your experience at Communal. While I agree that it is on the spendy side, and probably more of a "special occasion" restaurant, the food I received on both occasions was delicious. Did you have a chance to try the butterscotch pots de cremes or the scallops? Heaven. those toad stools are PERFECT in every way!